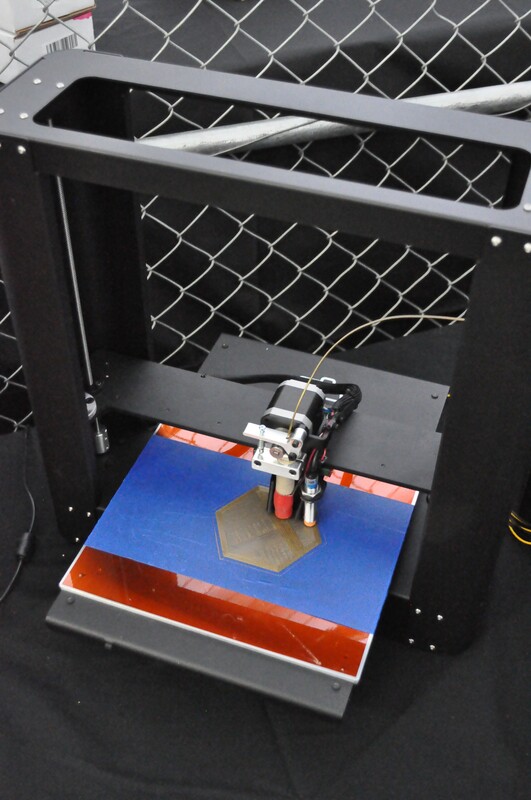 The new printrbot Play: all metal construction and printrbot quality in a smaller package. 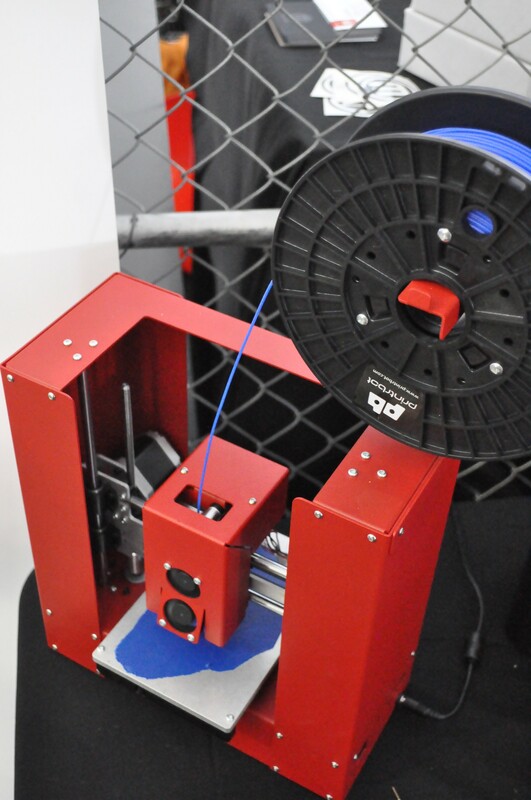 The shielded extruder makes it ideal for kids. For $399 the price can’t be beat. 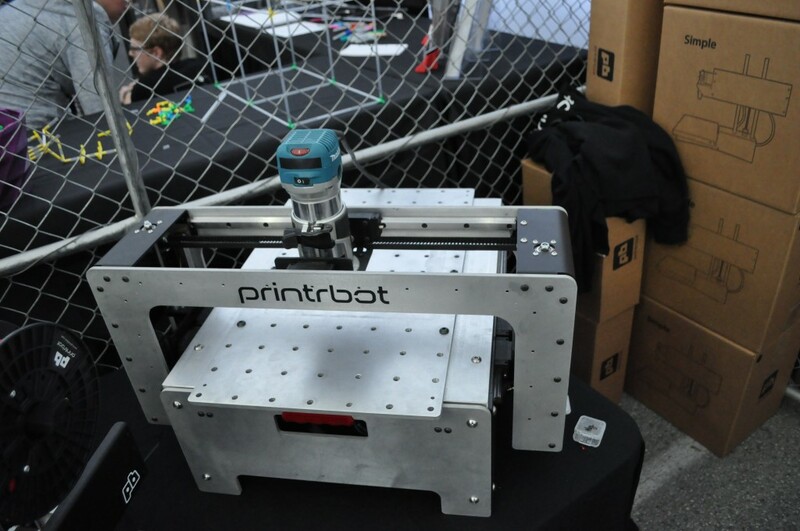 Printrbot Plus: a massive 10″ cube build volume with heated bed. An amazing value for an all metal machine. 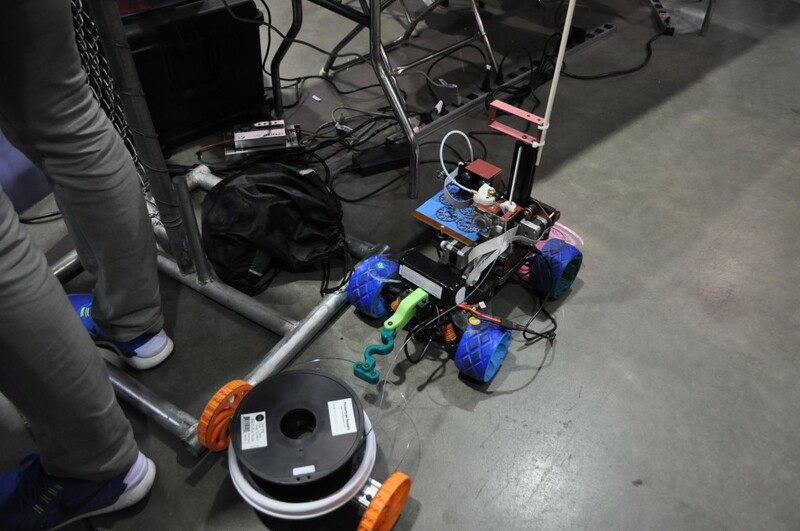 Printrbot goes subtractive! 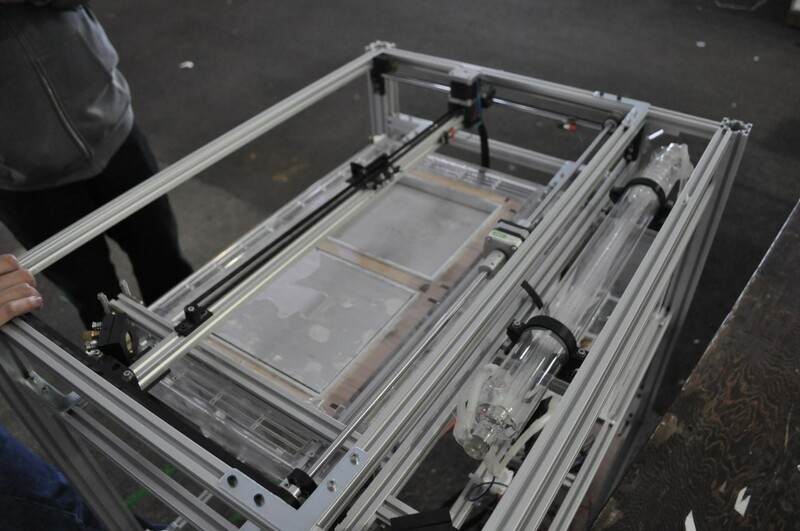 Their new CNC router features printrbot’s usual formula of amazing engineering quality at ridiculously low prices. 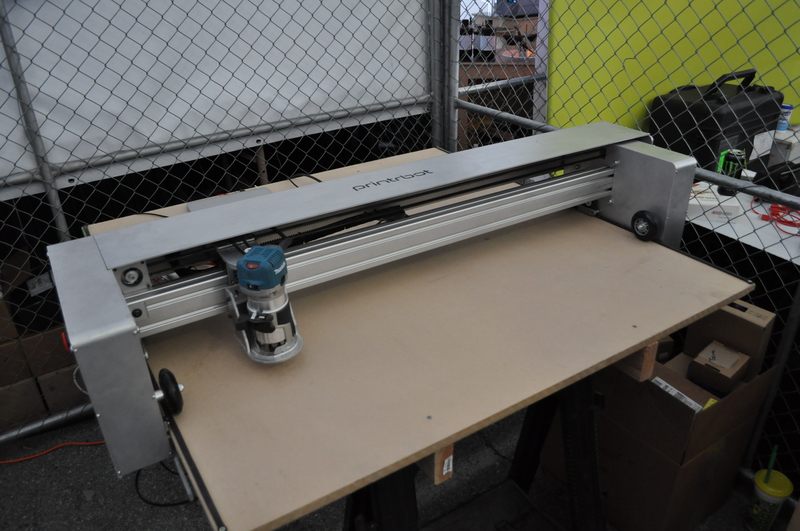 This innovative CNC router from printrbot rolls directly on the spoilboard. This machine can be set up on saw horses when needed and then stores compactly. 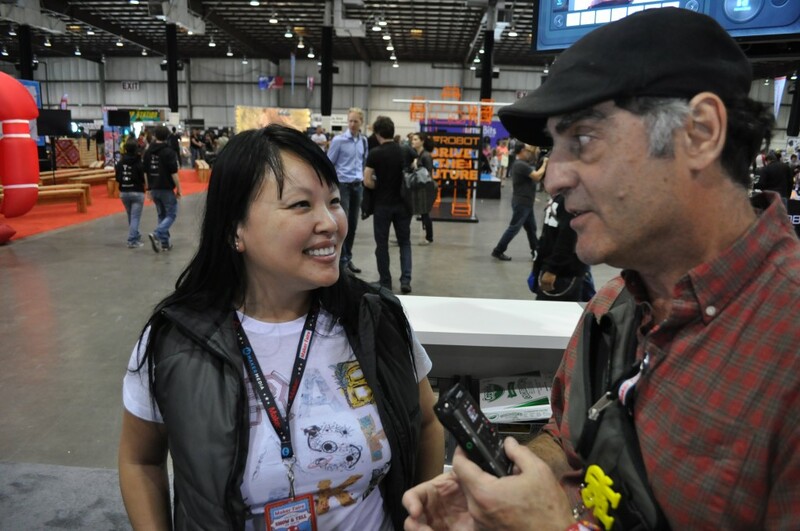 Andy talks with Filippo Moroni of Fonderie Digitali, one of several Italian companies represented in a special section. From the country that brought us Ferrari comes the Wasp, a beautifully made delta that they claim is the world’s fastest FDM machine. 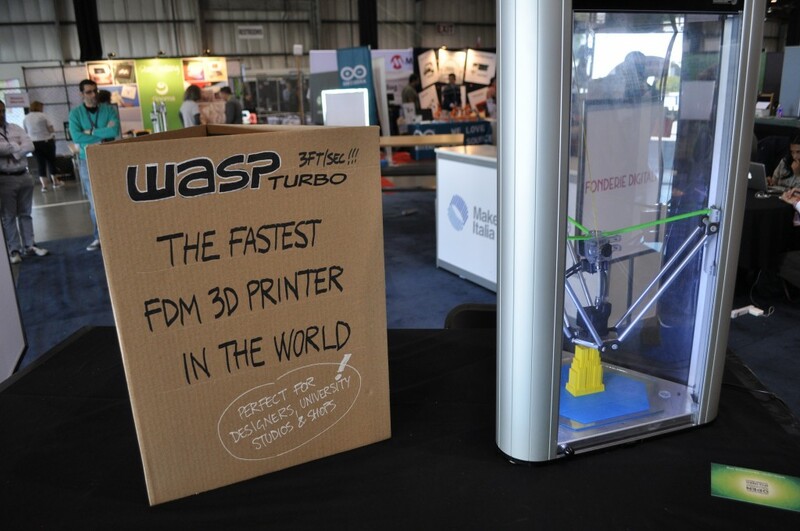 The Wasp features an odd hybrid Bowden system. 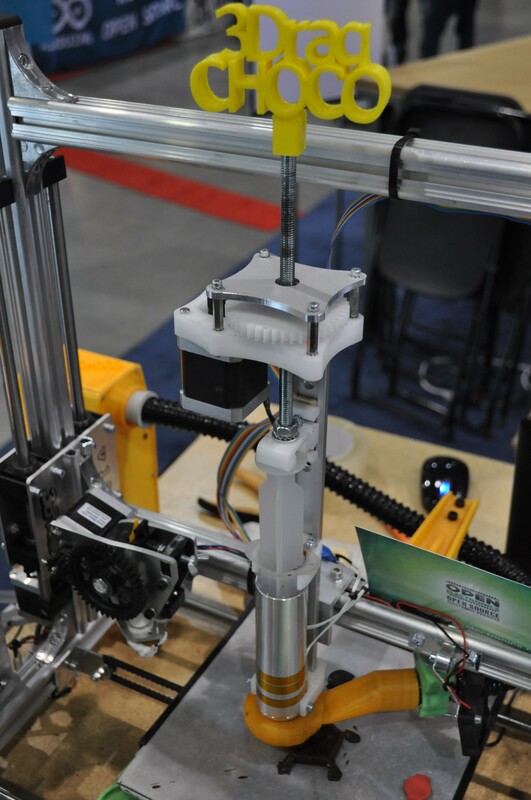 The extruder is hung from the carriages using 3 rubber connectors and attached to the hotend via a short Bowden tube. This allows the hotend to travel amazingly fast while the extruder sort of bounces along after it, loosely coupled via the Bowden tube. 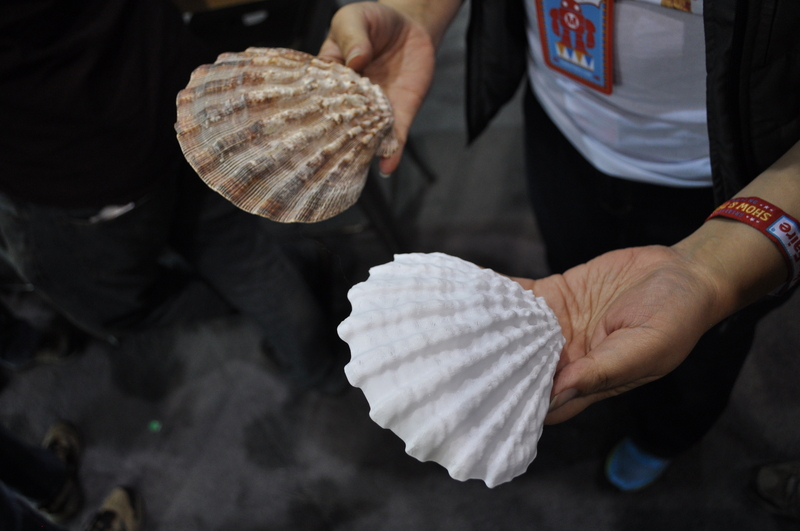 They get the reduced moving mass of a Bowden with the shorter filament path and quick retraction of a direct extruder. 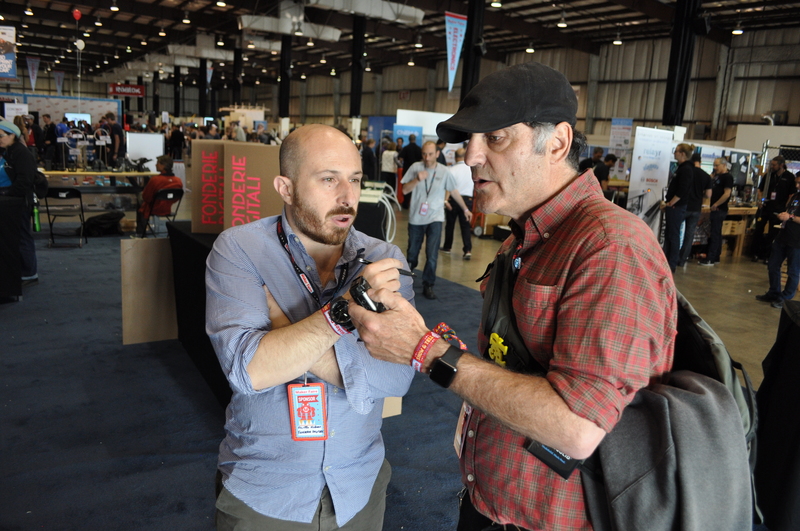 Andy talks with Sheau-Lan Reed, head of HP’s new Sprout project. 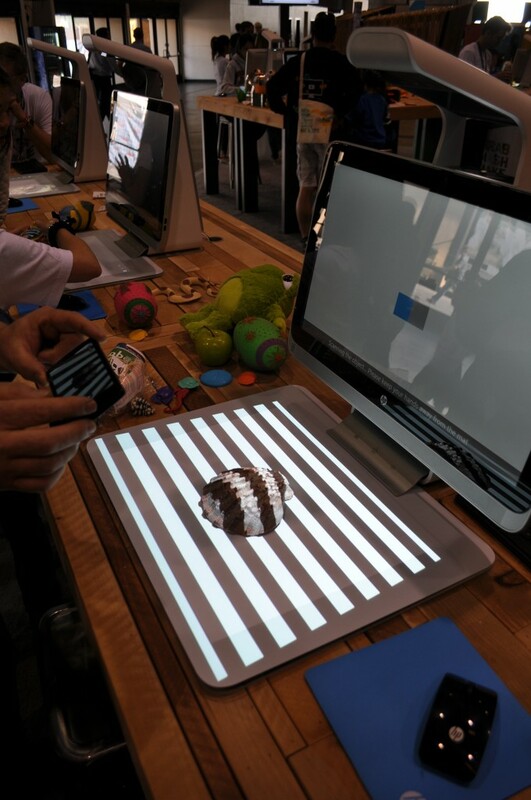 The Sprout combines a touch screen computer with a touch pad, a projector and a 2d/3d scanner all in one slick package. 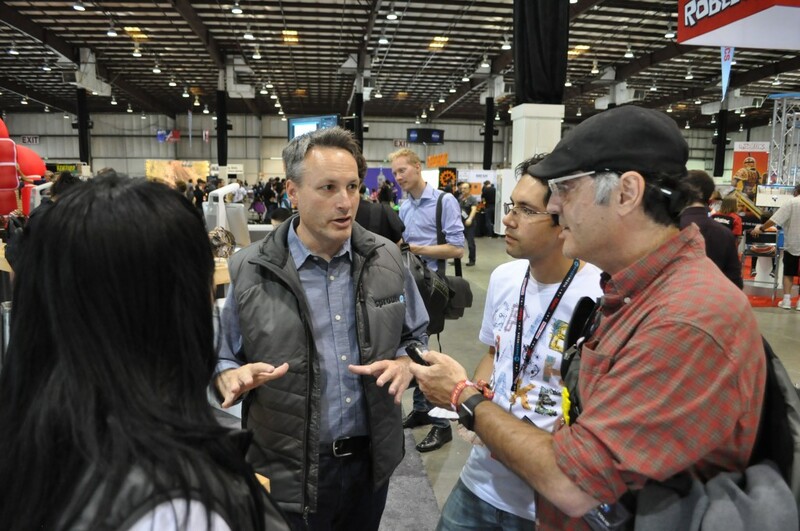 The longer we talked with the HP crew the more people they pulled in to answer our questions. 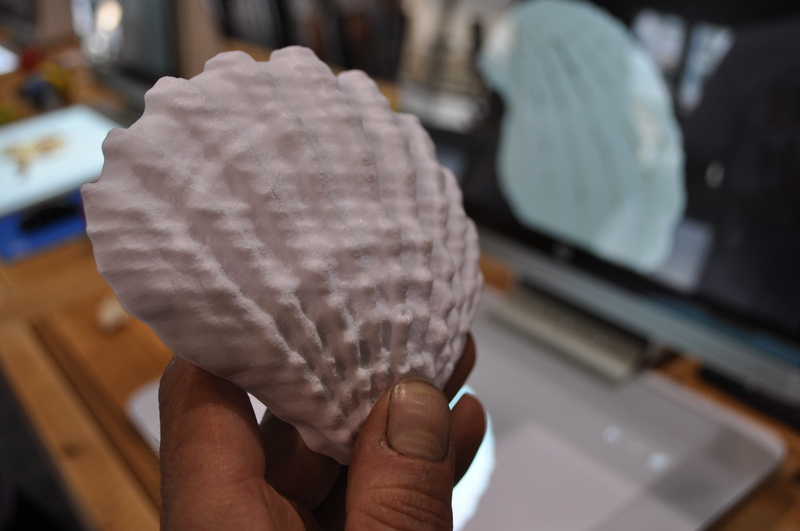 Here is a print of the shell they scanned. 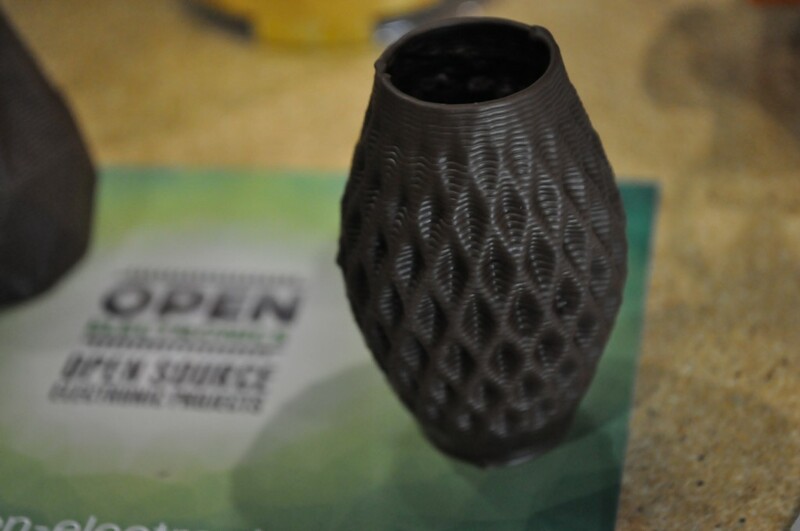 The package is sweet, the interface is very slick, but the scans all showed some serious artifacts. If they can clean this up it would be a must-have machine. Dennon Oosterman of ReDeTec during a quiet moment of Friday afternoon. Could this finally be a filament recycler that really works? 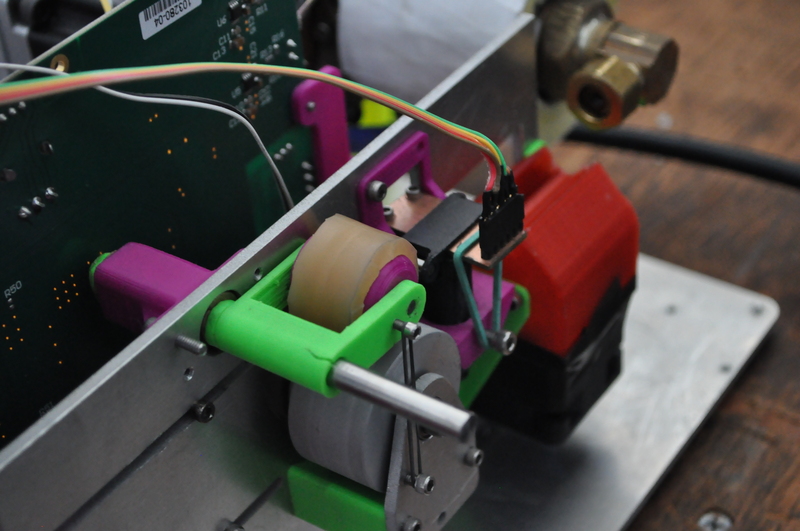 The ptototype ReDeTec filament extruder. 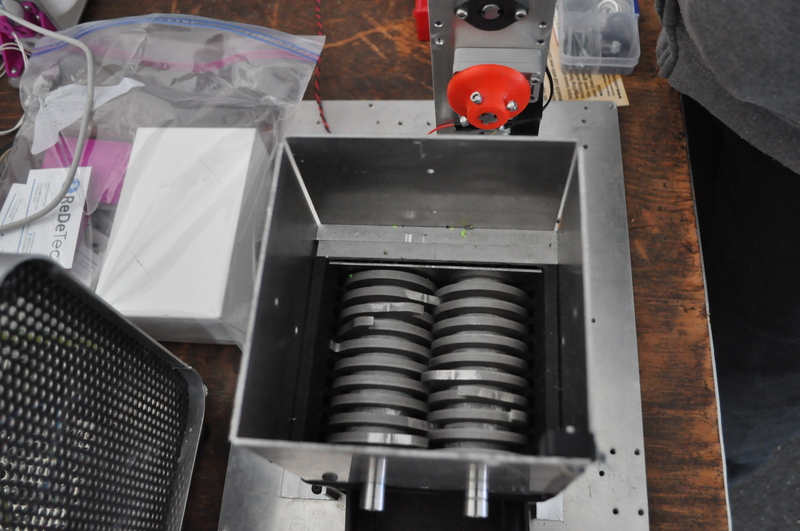 These rollers pull the freshly extruded filament to stretch it to precisely the right diameter. The whole system is close loop controlled. Here is the machine actually extruding pretty good looking filament from virgin pellets. The extruder was paired with a nice looking print grinder. The only thing odd was that it was operated by a hand crank. I guess you are unlikely to get your hand pulled into the machine if you are cranking it with your other hand. Still it looked a bit awkward. On Saturday morning he drew such a crowd we couldn’t get near him. 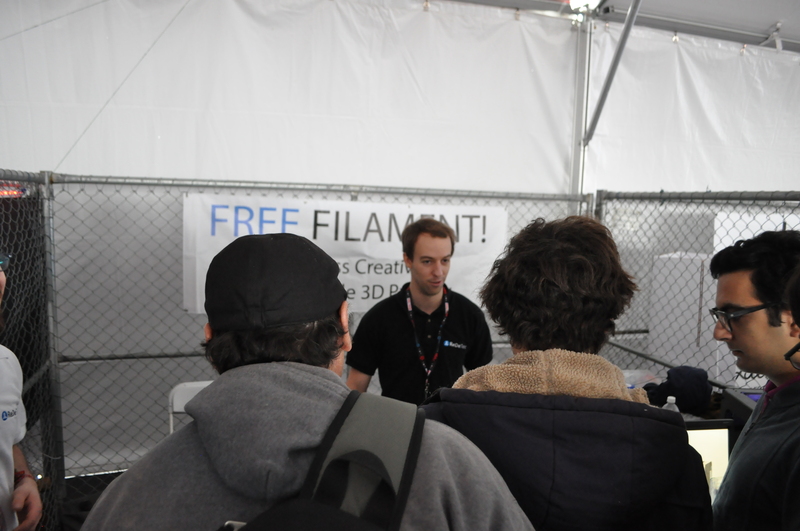 Could it be the “Free Filament” sign? 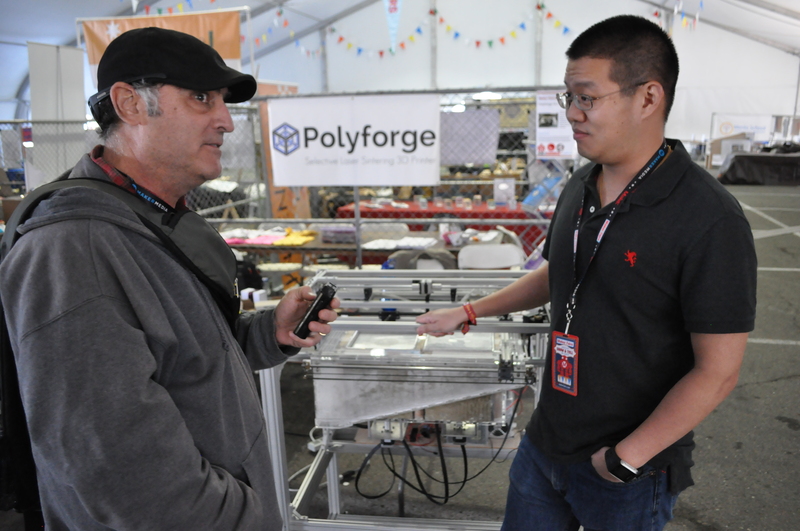 Andy talks with Patrick Lie founder of PolyForge, one of the first low cost selective laser sintering printers we have seen. 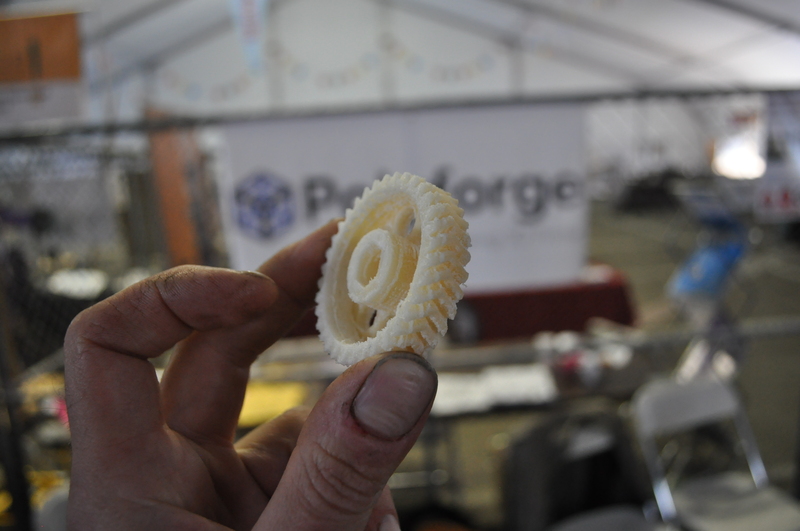 Polyforge uses inexpensive stock laser cutter parts to fuse plastic powder. The results aren’t yet equal to what can be achieved with other, cheaper technologies, but it is a great start. Now that the key patents have started to expire we look forward to a large open source community taking on this technology and bringing SLS to the masses. 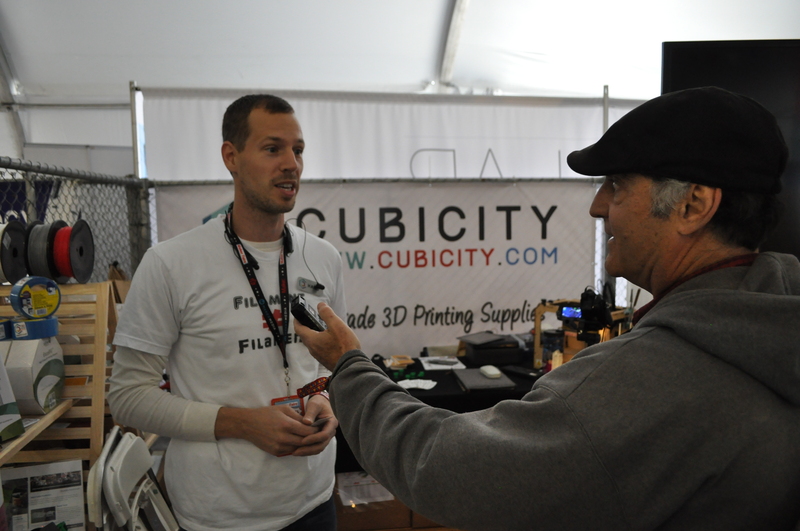 Andy interviews Hans from Cubicity, bringing quality European filaments to American market. 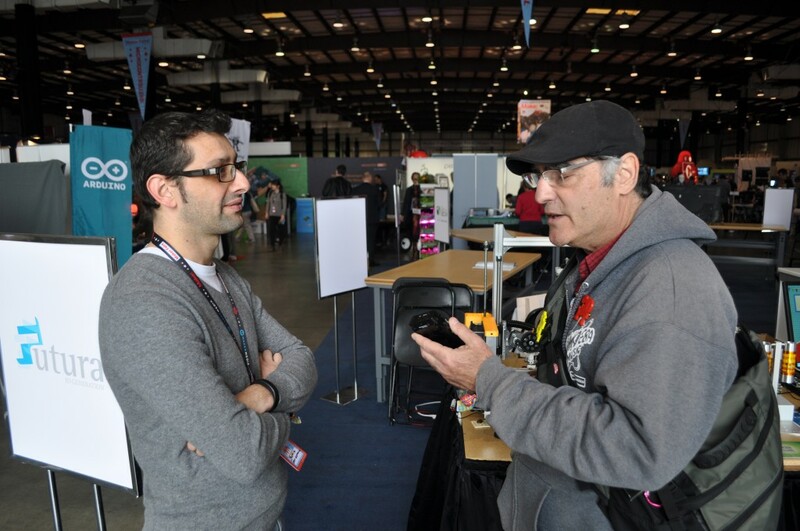 Boris from Open Electronics talking to Andy about his Chocolate printer. 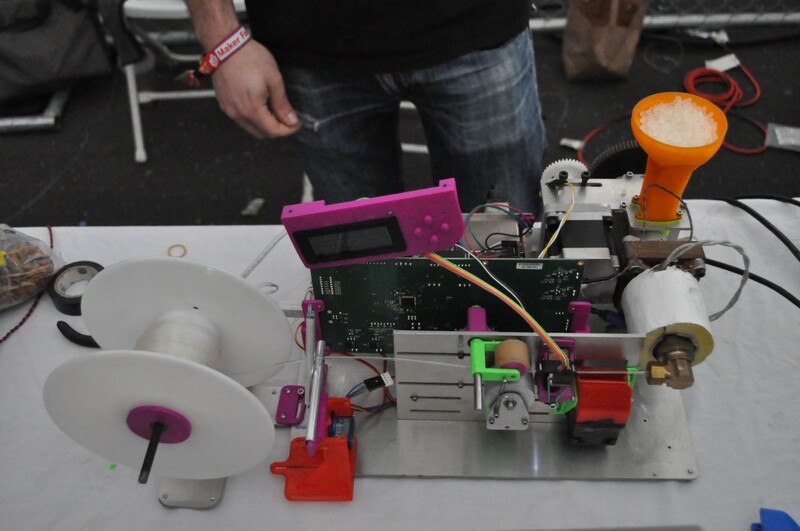 The heated syringe extruder was printing nicely at the show. An optional heated stand keeps two more syringes perfectly heated and ready to swap in for continuous chocolate printing. 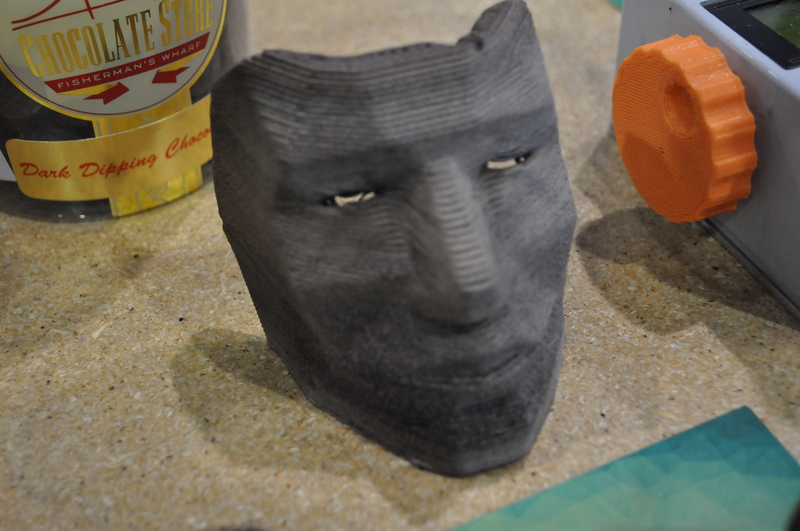 This mask was their coolest print, but it was made with regular chocolate that wasn’t tempered properly so the cocoa butter “bloomed” giving it a chalky grey finish. They switched to a more forgiving coating chocolate and the results were beautiful. The good news is that the machine is all open source. The bad news. . . they weren’t giving out samples. 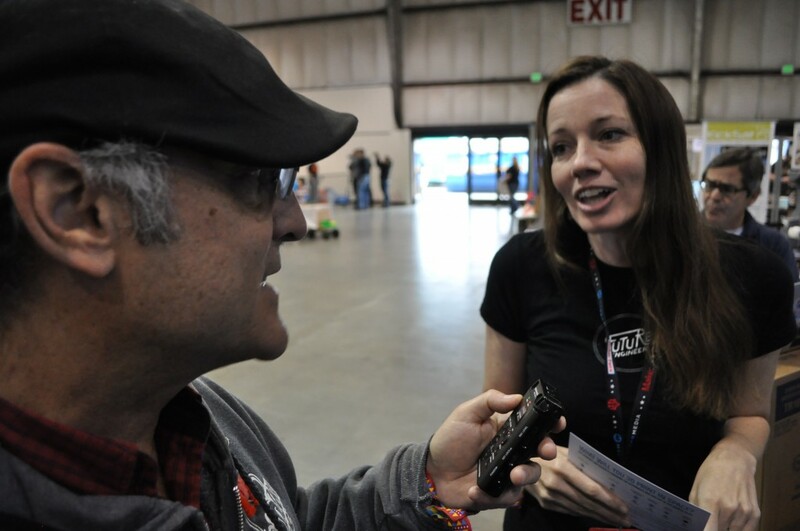 Andy talks with Deanne Bell from Future Engineers. 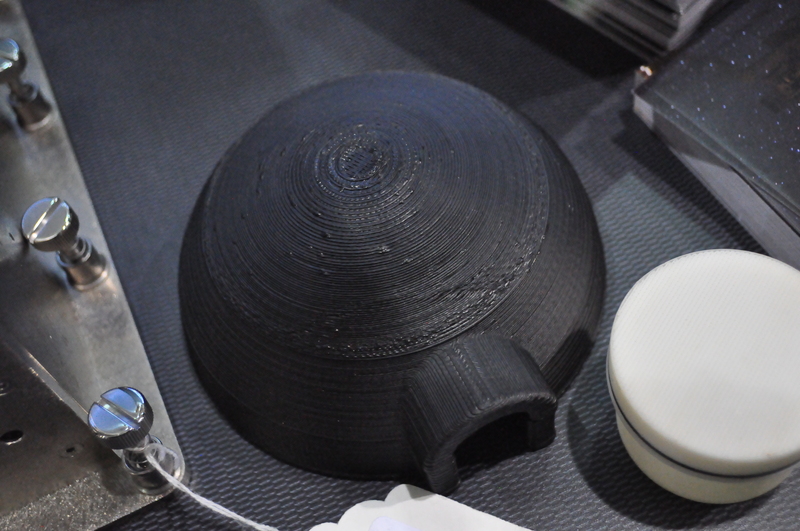 They sponsor contests for students to design 3d printable objects for the space station. The winner’s designs are actually printed in space. 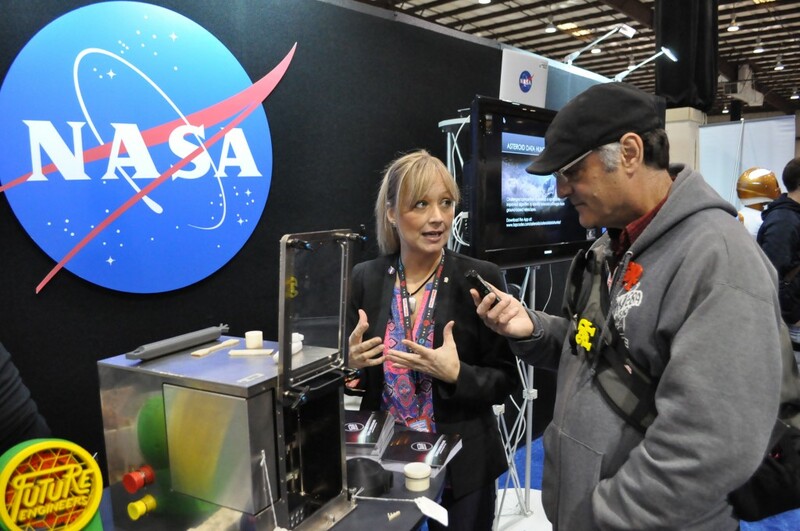 Andy talks with Niki Werkheiser, the NASA project manager in charge of the space manufacturing program. 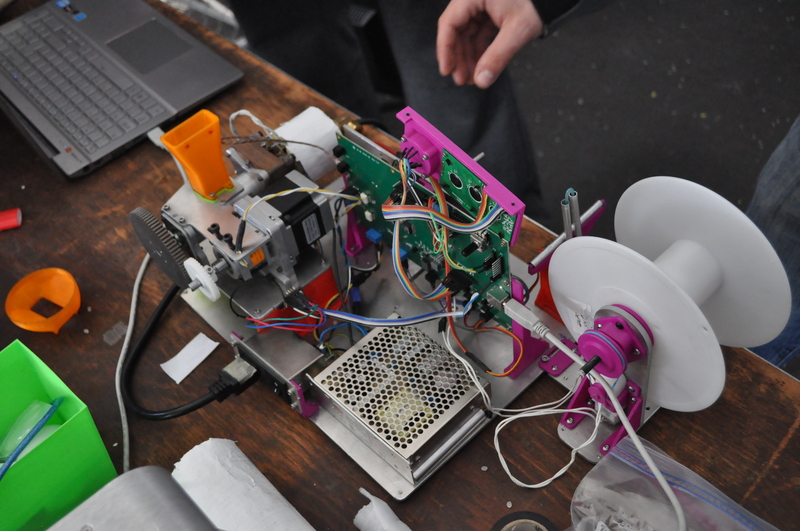 We got our first look inside the space printer, but no photos allowed. 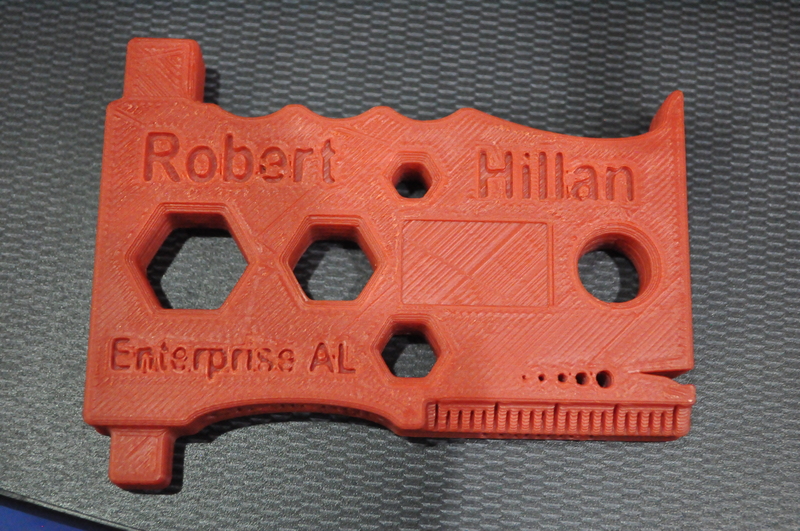 An overhang printing test similar to test prints made on the space station. Can you do without support when printing in micro gravity? We eagerly await the results. This simple 3d printable igloo like structure may someday be printed on the moon by fusing moon dust using concentrated sunlight. 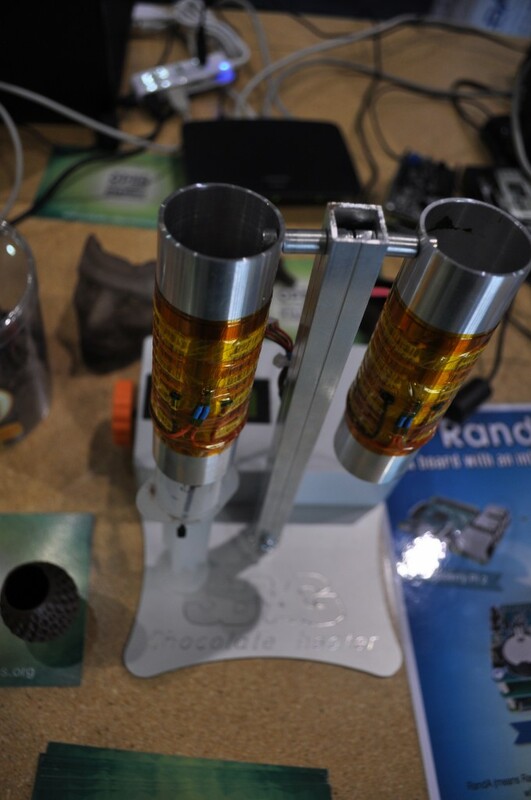 This sort of technology could be used to build a moon base quickly and cheaply. It could perhaps be automated to the extent that humans could arrive with their base already mostly built. 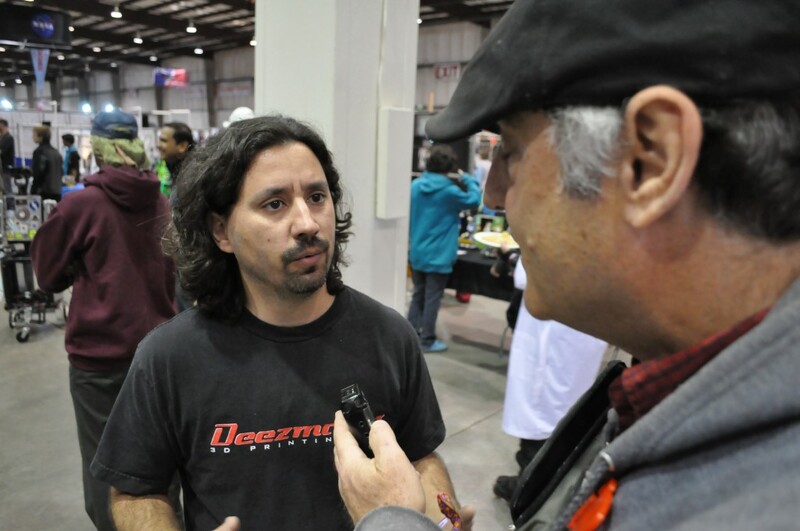 We caught up with our old friend Diego Porqueras from Deezmaker in Pasadena. 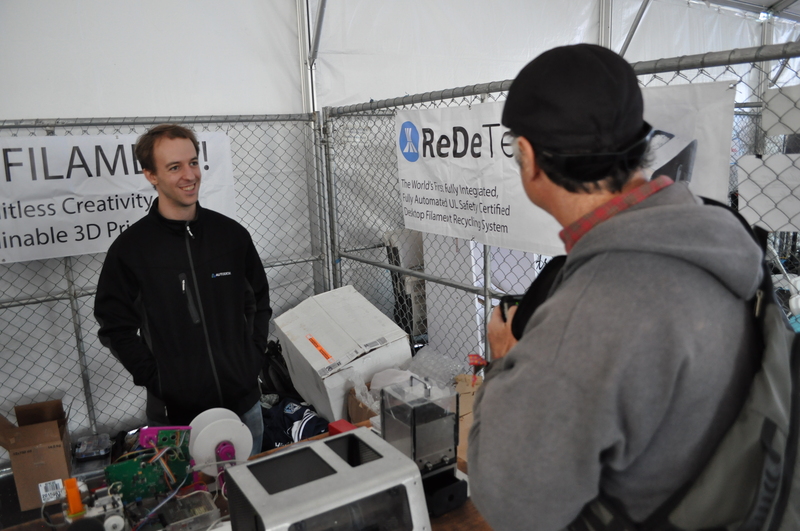 He still had the only printer at the show that you could drive around while it prints. 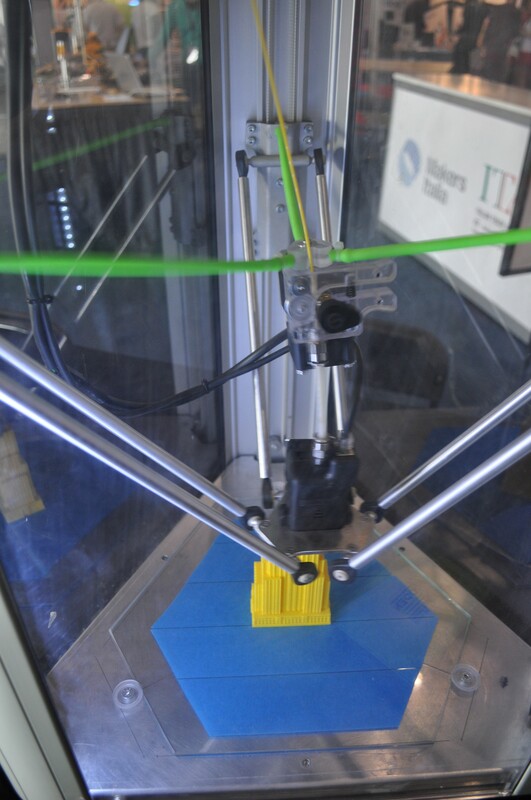 He has flown it on a quadcopter while printing as well. 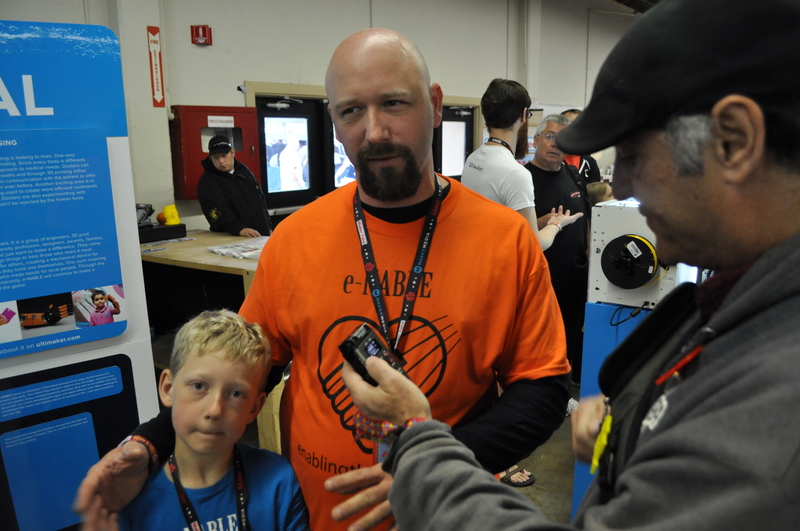 Andy talks with Lucas Dennison and his dad Greg from e-Nable. 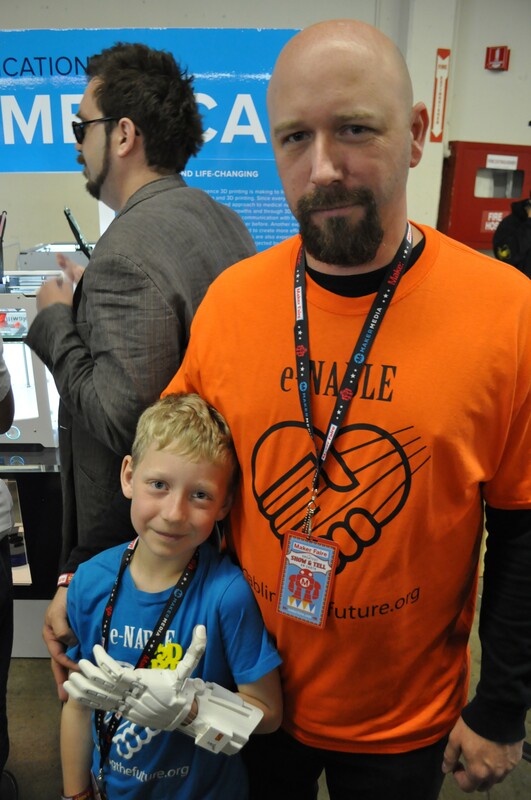 Before his dad started 3dprinting them Lucas had never had a prosthesis. 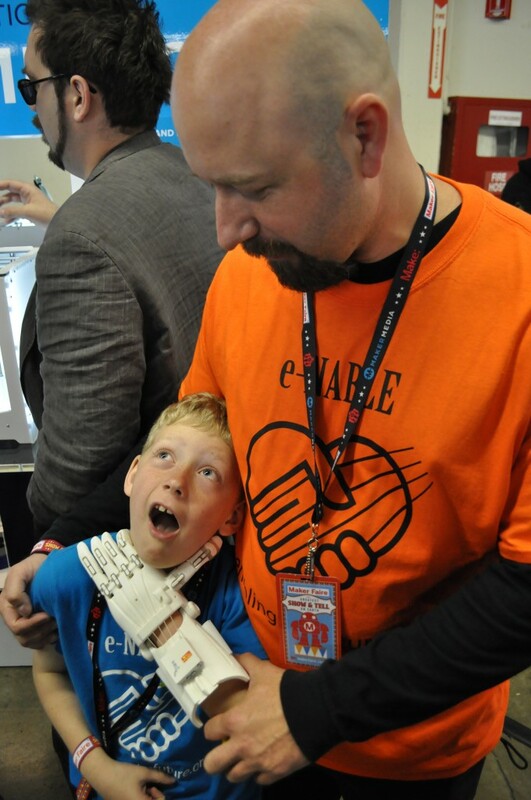 E-nable connects people with printers with people who need prosthetics, and provides support and know how. Conventional prosthetics are extremely expensive and kids like Lucas outgrow them very quickly. 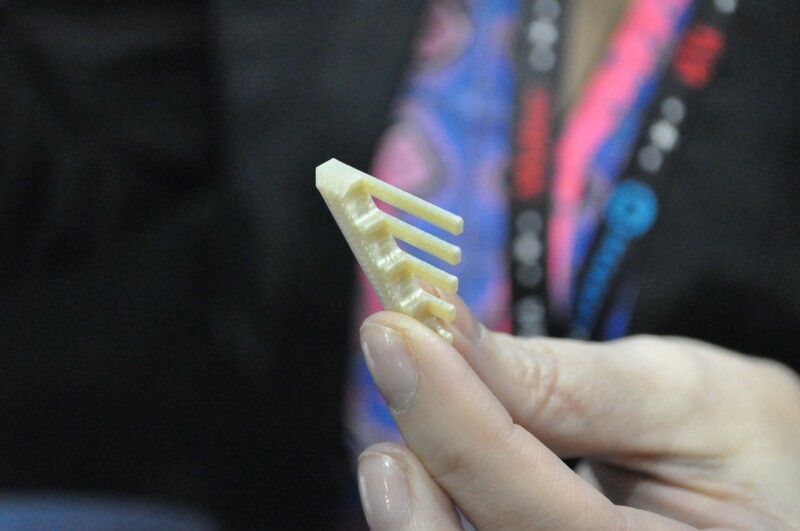 3d printing is a real game changer by bringing the cost within reach of anyone. Lucas can have different hands for different uses. He can have a new one whenever he needs it so he will never outgrow it. 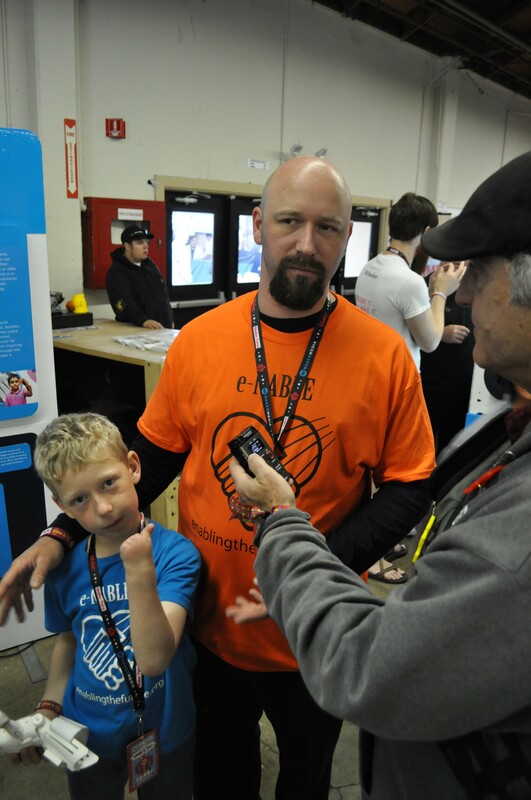 Lucas was very comfortable clowning around with his 3dprinted prosthetic hand. Visit enablingthefuture.org for more information or to volunteer.